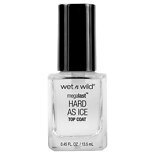 Shop Wet n Wild MegaLast Hard as Ice Top Coat-Rock Party Weekend (CLEAR) -219B Clear (.45 oz. ).45 oz. Shop Wet n Wild MegaLast The Saving Base-Never Basic (CLEAR) -220D Clear (.45 oz. ).45 oz. Shop SinfulColors SinfulShine Step 2 Top Coat Nail Color Clear (.5 oz. ).5 oz.